usb over ethernet on linux, usb over ip for linux , usb over network on linux devices, network usb port linux machines, share usb, umote access to them. You can connect to a device attached to a Linux machine from Windows PC or Mac and vice versa. FlexiHub is a software that enables you to access and manage USB devices remotely over network. Thus, for example, you can send documents for a printout to your office printer while you are working from home or access the contents of a USB dongle attached to your colleague's PC, as long as you are in the network. FlexiHub works as a control panel for all shared USB devices in the network forming a hardware cloud accessible by network users. 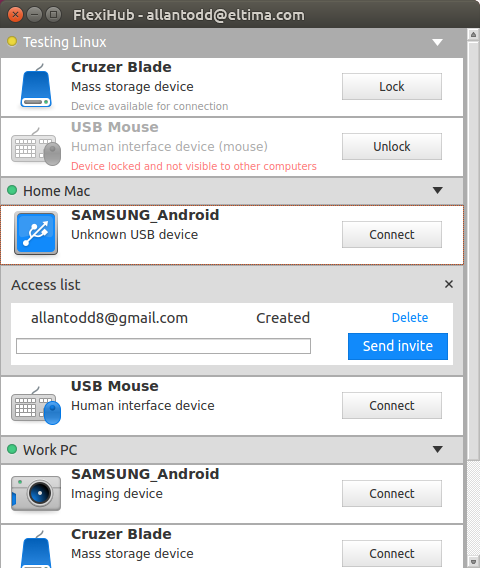 There is absolutely no difference whether the device you access is attached to your computer or another computer somewhere else.Your shared device can be accessed and used by any FlexiHub user you invite. Using the app is really easy, you first have to download and install it. FlexiHub consists of server and client parts: the former goes to a computer whose USB ports are to be shared, and the latter -- to computers that need access to these ports. The application will list all computers in the network as nodes and you will see USB devices attached to them. The app also displays information about devices' types, so it is easier for you to find the device you need to connect to. Sharing USB devices with the help of FlexiHub is safe and secure, thanks to 256-bit SSL encryption. No unauthorized party can access your data. Data traffic is reduced by FlexiHub via data compression. Information for developers: FlexiHub can be integrated into other software solutions and distributed as part of them. You can sign up for the API evaluation program and try integrating FlexiHub. Added: the ability to send connection invites to other FlexiHub users. Improved: the network communication has been optimized to reduce traffic. Fixed: auto-reconnect could break the existing connection with another node.